If you still can't achieve what you want using Mura's out-of-the-box folder customizations, you can create your own folder output as well. 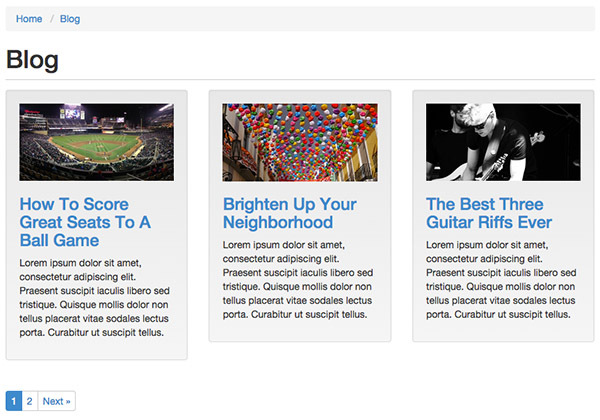 As we discussed in the Class Extensions tutorial, Class Extensions are a way to add attributes to a new page subtype. Class Extensions can also be used as a hook for Mura to intercept a particular subtype, and change its default behavior. 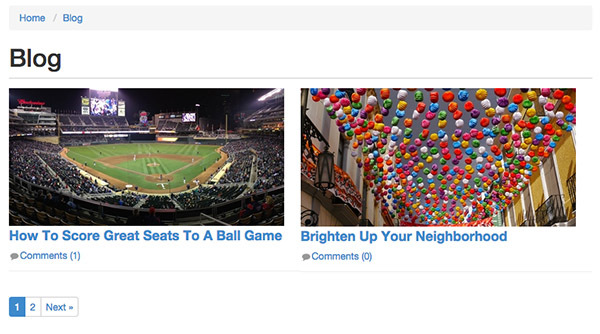 To do this, we need to create a new Folder with a SubType of Blog. Now we can create a new Blog folder with this sub type and hook into it in our code. Note: the title of your file may be case sensitive depending on your server operating system. It is recommended that you title your file in the same case as the name of your extended attributes. Now that Mura is registering our custom folder instead of the default one, we can go into our custom file and modify it however we choose. When you open the file, the first 130 lines of code or so is all core logic that you will want to keep to make certain aspects of your folder operate, such as pagination, category filters, etc. Do not edit this logic unless you really know what you're doing! What this code does, is take all of the folder logic above it, then pass it through a file called dsp_content_list.cfm. dsp_content_list.cfm is an extremely complex file, that has all sorts of logic to display all of the possible items and arrangements for the folder items (i.e. 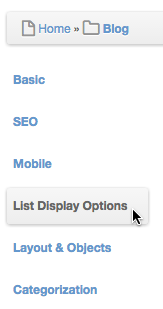 all of the options you saw on the List Display Options above). Since we want to roll our own output for our blog, we will actually replace this entire code blog with our own iterator and loop through the blog items using our own markup. As we learned in the Mura Iterators tutorial, Mura Iterators are a way to take content from a feed and loop through it using your own markup. In the main logic of thedsp_folder_blog.cfm file, all of the folder's contents are being loaded into its own iterator (variables.iterator), ready to be looped through. 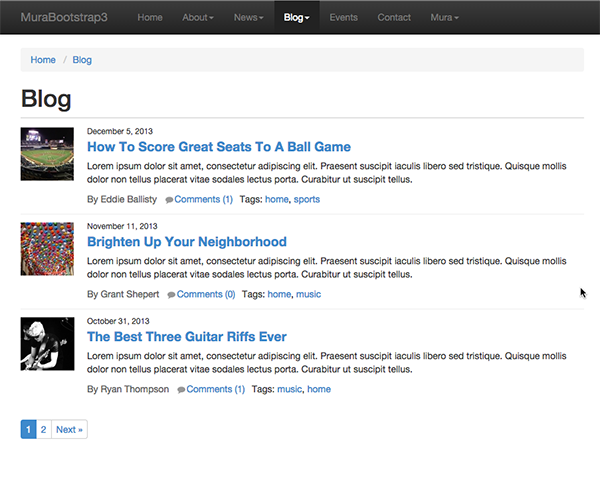 Note 2: I created a custom image size in my Mura Site Settings called blog-imgthat is 400x200. 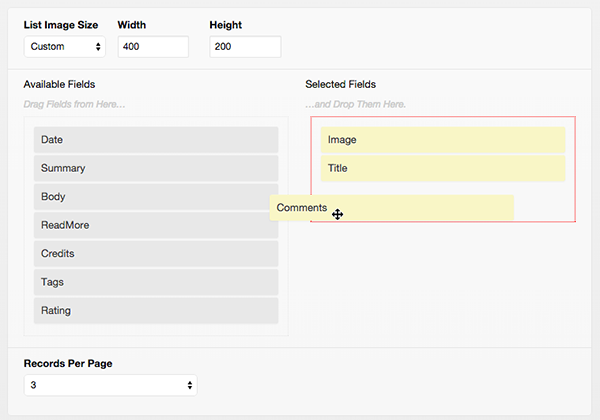 The benefit of doing this is so that users can control the cropping of the image for it to appear in the output. Creating custom folder layouts is a great way to create creative, robust themes without having to worry about breaking core Mura functionality. This method can be used for several different use cases when developing your themes, such as Blogs, Portfolios, Team pages, etc.